T-Mobile Park is a retractable roof baseball park located in Seattle, Washington. Owned and operated by the Washington State Major League Baseball Stadium Public Facilities District, it is the home stadium of the Seattle Mariners of Major League Baseball (MLB) and has a seating capacity of 47,929 for baseball. 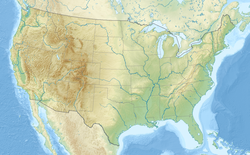 It is located in Seattle's SoDo neighborhood, near the western terminus of Interstate 90. The first game was played on July 15, 1999. During the 1990s, the suitability of the Mariners' original stadium—the Kingdome—as an MLB facility came under doubt, and the team's ownership group threatened to relocate the team. In September 1995, King County voters defeated a ballot measure to secure public funding for a new baseball stadium. Shortly thereafter, the Mariners' first appearance in the MLB postseason and their victory in the 1995 American League Division Series (ALDS) renewed a public desire to keep the team in Seattle. As a result, the Washington State Legislature approved an alternate means of funding for the stadium with public money. The site for the stadium, just south of the Kingdome, was selected in September 1996 and construction began in March 1997. The bonds issued to finance Safeco Field were retired on October 1, 2011, five years earlier than anticipated. 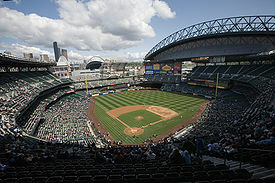 The ballpark was originally named Safeco Field under a 20-year naming-rights deal with Seattle-based Safeco Insurance. Safeco declined to renew the agreement beyond the 2018 season, and the naming rights were acquired by T-Mobile on December 19, 2018. The name change took effect January 1, 2019. 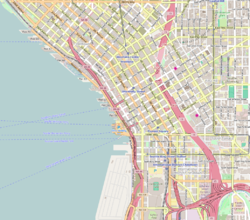 T-Mobile Park is located in the SoDo district of downtown Seattle, bounded by Dave Niehaus Way (a block of 1st Avenue S.) to the west, Edgar Martínez Drive (formerly S. Atlantic Street) to the south, Royal Brougham Way to the north, and BNSF railroad tracks to the east. 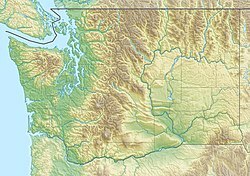 The stadium is located near the western terminus of Interstate 90, the longest interstate in the United States. Parking is available at the stadium's parking garage located across Edgar Martínez Drive, the CenturyLink Field garage to the North, and other privately operated lots in the area. Sounder commuter rail services nearby King Street Station. T-Mobile Park is also served by Sound Transit's Central Link light rail line and local Metro bus routes via the nearby Stadium Station. On September 9, 1996, the site was selected for the new stadium, just south of the Kingdome. In late fall, several members of the King County Council wrote a letter to the Seattle Mariners, requesting a postponement of the projected $384.5-million stadium project. In response, Mariners ownership held a news conference stating that they would either sell the team or move it from Seattle. After a public outcry, the King County Council voted to reaffirm their cooperation with the Mariners in building a new stadium. Team ownership contributed $145 million to cover cost overruns. Construction officially began on March 8, 1997 with a groundbreaking ceremony featuring Mariners star Ken Griffey, Jr. The construction, overseen by Chief Financial Officer (and current team President and minority owner) Kevin Mather, continued through the beginning of the 1999 season. The first game in the new stadium was played on July 15, 1999, in which the Mariners were defeated 3–2 by San Diego Padres. The original naming rights to the stadium were sold to Seattle-based Safeco Insurance, who paid $40 million for a 20-year deal. 2018 was the final season played under this name, and the Safeco signage was removed from the ballpark beginning that November. The naming rights were awarded to T-Mobile on December 19, an agreement that will last 25 years. The name change officially took effect on January 1, 2019. The Mariners moved the fences at Safeco Field closer to home plate prior to the 2013 season "to create an environment that is fair for both hitters and pitchers," according to General Manager Jack Zduriencik. Safeco Field had been considered one of the most pitcher-friendly ballparks in the majors since it had opened. The center field scoreboard and ad panels were replaced with an 11,435 square-foot board during renovations, becoming the largest among all stadium scoreboards in the major leagues at the time. After the 2017 season, the field surface, which had been in place since the stadium opened in 1999, underwent its first full replacement. The infield and foul territory were redone in 2012, but the outfield had never been replaced before the resodding. Like most ballparks built from the 1990s onward, T-Mobile Park is a 'retro-modern' style ballpark that incorporates many of the features of ballparks built in the 1950s and earlier with modern amenities. In contrast with the Kingdome and the other multi-purpose stadiums built primarily during the 1960s and 1970s, T-Mobile Park features a brick façade, an asymmetrical field dimension, a natural grass field, spectator sightlines more suited for baseball, and is surrounded by city streets, a railroad line, and buildings. Modern features include a retractable roof, luxury suites, extensive food and beverage selection beyond traditional ballpark fare, full ADA-accessibility, and previously had technology that allowed spectators to monitor special game-time features with Nintendo DS receivers. There are five main levels to the stadium: Field (or Street), Main Concourse (100 level – 20,634 seats), Club Level (200 level – 4,585 seats), Suite Level (1,945 seats), and Upper Concourse (300 level – 15,955 seats). Two bleacher sections are located above left field and below the center field scoreboard, with 3,706 seats. The Broadcast Center (press box) is located on the Club Level and sub-level between it and the Main Level. As the field is approximately at street level, entry into any of the main gates requires visitors to ascend a flight of stairs, escalator, or elevator to access the main concourse, with the exception of the Right Field Entry, which opens onto the main concourse. Stairs, escalators, elevators, and ramps located around the ballpark provide access to all levels. T-Mobile Park has an extensive food and beverage selection above and beyond the traditional ballpark fare of hot dog, pizza, soda, and beer. Concession stands selling traditional ballpark fare are plentiful on the main and upper concourses. Food courts behind home plate on the main concourse, as well as in "The 'Pen" (known as the Bullpen Market prior to a major 2011 remodel) located on the street level inside the Center Field gate, sell items such as sushi, burritos, teriyaki, stir-fries, pad thai, garlic fries, crepes, health food, seafood, and barbecue. An extensive selection of beer can also be found in those locations, as well as a location on the upper concourse. Patrons could previously order food with a Nintendo DS app called Nintendo Fan Network. T-Mobile Park has a unique retractable roof that only acts as an "umbrella" for the playing field and stands, rather than forming a complete climate-controlled enclosure, as is the case with all other retractable roofs in Major League Baseball. The park rarely needs to be heated or cooled due to Seattle's mild climate, but frequent precipitation necessitated a roof. The roof is sometimes closed on particularly cold nights, which helps prevent radiation heat loss. The only other covered baseball stadium in the world with permanent openings is the fixed-roof Seibu Dome in Tokorozawa, Saitama, Japan, home of the Saitama Seibu Lions. On April 7, 2013, Total Pro Sports voted Safeco Field the 8th Best Place to Catch a Game in 2013, mainly owing the award to the design of the retractable roof. T-Mobile Park features a manual scoreboard, the second-largest HD video display scoreboard in MLB, a color LED out-of-town scoreboard, and LED ribbon boards along the terraces. The main scoreboard, which replaced the original scoreboard above the center field bleachers prior to the 2013 season, is more than 11,000 square feet in area. The board can be used either all at once, such as for live action or video replays, or split into sections for displaying information such as statistics and advertisements. "The Defining Moment", a mural depicting Edgar Martínez's famed "The Double". A bronze statue of Mariners broadcaster Dave Niehaus (1935–2010) was unveiled on September 16, 2011. The statue captures the broadcaster honored by the Baseball Hall of Fame with the Ford C. Frick Award in 2008, and who broadcast 5,284 Mariners games over 34 seasons (1977–2010), at a desk, behind a microphone, wearing headphones with his Mariners scorebook in front of him. His scorebook is opened to the box score for Game 5 of the 1995 American League Division Series, when Edgar Martínez hit "The Double". There is an empty seat next to the statue, so fans can sit next to Niehaus and pose for photos. His longtime broadcast partner Rick Rizzs presided over a private ceremony to unveil the statue. The Dave Niehaus Broadcast Center is located on the Club Level behind home plate. When Niehaus died, his headset and microphone were placed by his empty seat in the Broadcast Center as a tribute. Prior to the 2017 season, a statue of Ken Griffey Jr. was unveiled outside the Home Plate Entrance to the ballpark. Following the 2017 season, the bat was broken off in an attempt to steal it, but a bystander from the office building across the street was able to run down the perpetrator and recover the bat, which was subsequently reattached. On June 8, 2012, six Mariners pitchers (Kevin Millwood, Charlie Furbush, Stephen Pryor, Lucas Luetge, Brandon League, Tom Wilhelmsen) threw a combined no-hitter against the Los Angeles Dodgers, marking the third no-hitter thrown by the Mariners, and the first one to be accomplished by the Mariners at the ballpark. On August 15, 2012, Mariners' pitcher Félix Hernández pitched the 23rd perfect game in Major League Baseball history and the first perfect game in Seattle Mariners history. This marked the second perfect game and third no-hitter at the park, all of which occurred in the 2012 season. This was also the first time in Major League Baseball history that two perfect games occurred at the same ballpark during the same season. On May 4, 2007, an NCAA Pacific-10 Conference baseball attendance record was set when the Washington Huskies hosted defending National Champion Oregon State in front of 10,421 spectators. Washington won the game, 6–2. The stadium has hosted several soccer matches prior to the opening of CenturyLink Field, which was designed for soccer. To prepare for soccer matches, the field has to be sodded to cover and replace the dirt infield. On March 2, 2002, the United States men's national soccer team played Honduras in a friendly match, winning 4–0 in front of a then-record crowd of 38,534. The stadium hosted four matches during the 2002 CONCACAF Women's Gold Cup in November, including two matches featuring the United States women's national soccer team, as part of qualification for the 2003 FIFA Women's World Cup. The first U.S. match, against Panama, had an attendance of 21,522; the second match, against Costa Rica, was attended by 10,079 fans. July 19, 2013 Paul McCartney — Out There Tour 45,229 / 45,229 $4,525,200 The stadium's first public concert, it also featured former Nirvana members on a performance of the song "Cut Me Some Slack". August 8, 2018 Pearl Jam — Pearl Jam 2018 Tour 88,142 / 91,918 $7,829,518 This was the first time in five years since the band last played in their hometown. On September 15, 2018, Russell M. Nelson, President of the Church of Jesus Christ of Latter-day Saints, along with his wife, Wendy Watson Nelson, and Second Counselor Henry B. Eyring, held a devotional that was attended by 49,089 church members, friends, and members of the community.